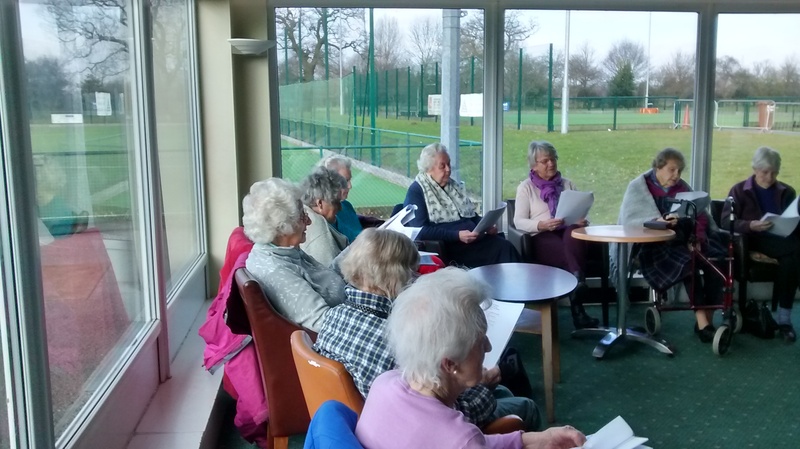 At Tarporley, we provided a range of activities; including seated exercises once a month, guest speakers and sing-alongs. Harveys Catering provides us with a two-course lunch and our quizzes and group activities stimulate the mind and spirit. We have lots of fun and laughter. Our other activities include meals out to local restaurants or pubs and day trips out. Transport can be arranged or members can choose to arrange their own. 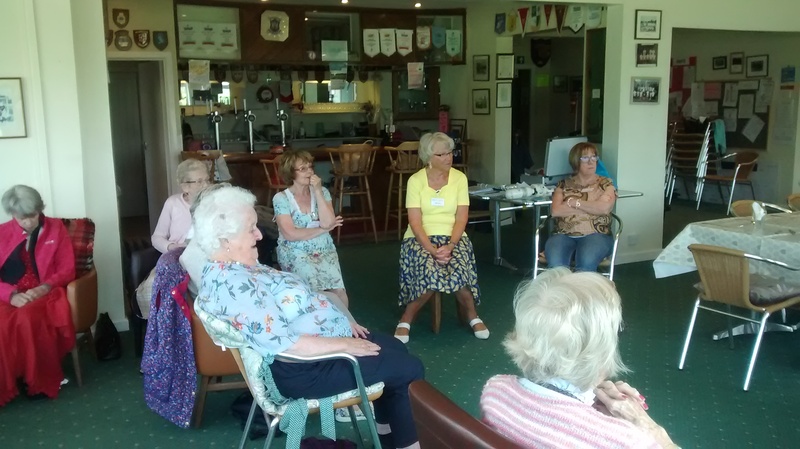 The club welcomes men and women from Tarporley and the surrounding areas, providing the opportunity to make new friends and spend quality time with others. Day Trip to Bridgemere Garden Centre 13th July 2018. 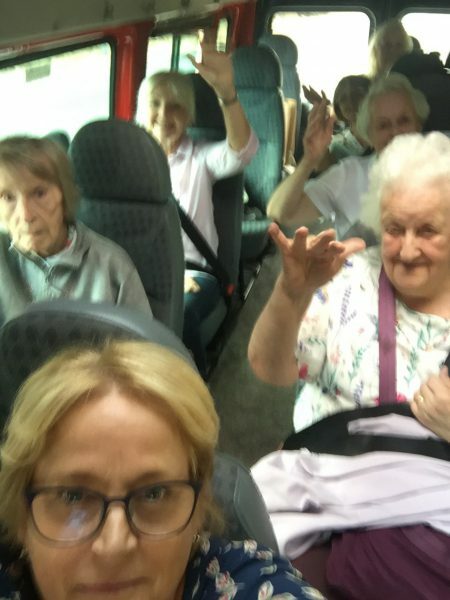 Some of the Tarporley OPAL club members and volunteers enjoyed a day trip to Bridgemere on Friday 13th July 2018. Cholmondeley Castle kindly lent us their bus for the trip and Winnie their driver looked after us very well. 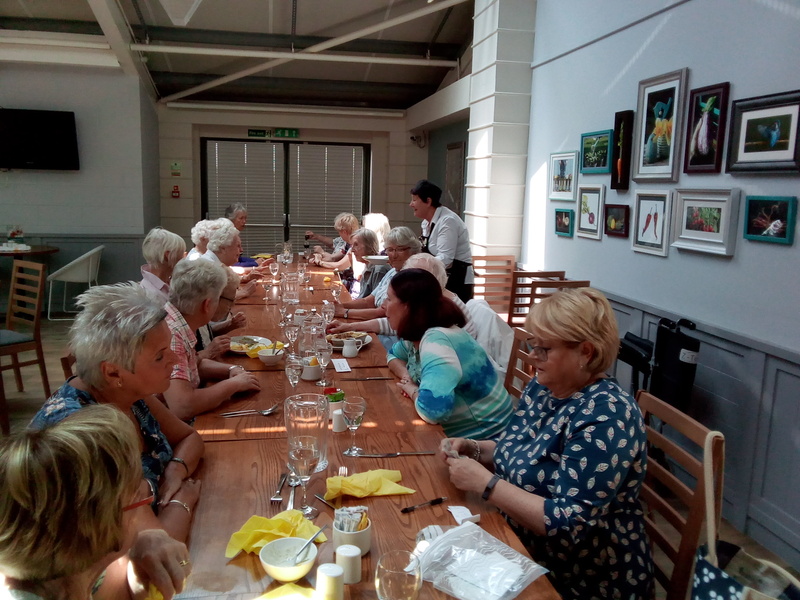 We had a two-course lunch served to us which was lovely, everyone enjoyed the meal and the refreshments. Of course, there was a spot of retail therapy while members and volunteers were on the lookout for bargains. A thoroughly enjoyable day was had by all. 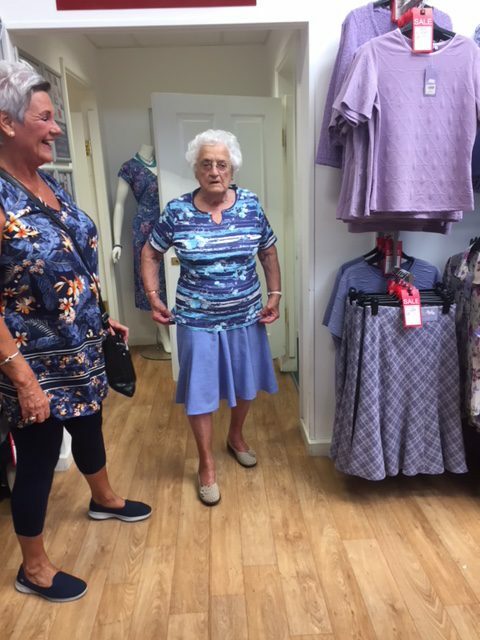 Eileen modeling her purchases with Anthea as her personal shopper ! 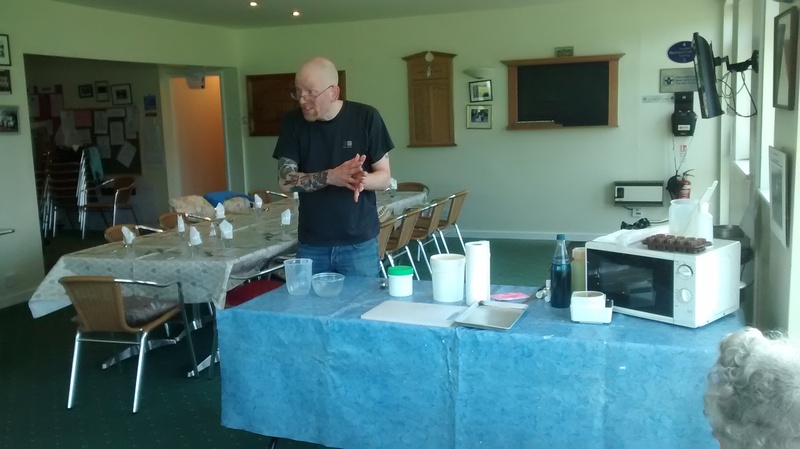 Matthew from Tiger Muffin Soaps, demonstrated how to make a bath bomb, speciality soaps and a shower gel. He provided an interesting demonstration on showing how he makes the products. He talked about the history of soap from earlier Grecian and Roman times through to Medieval England. Tarporley members were given a free sample of the soap he made today. 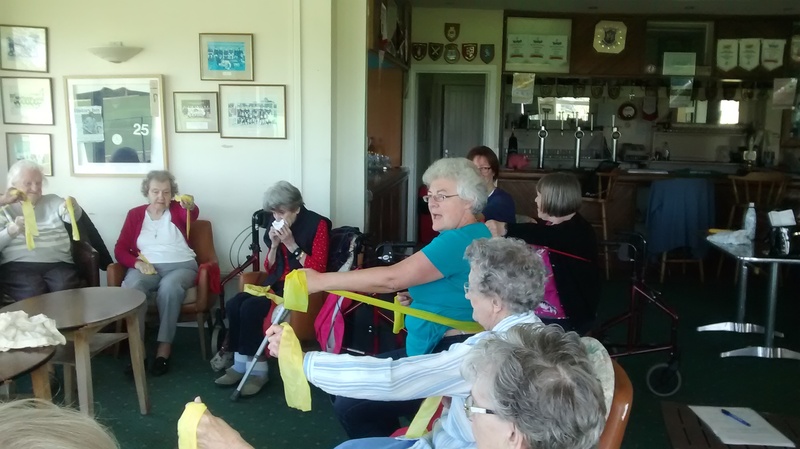 Eula Hersey carried out an exercise routine with the Tarporley Club members on 20th April. 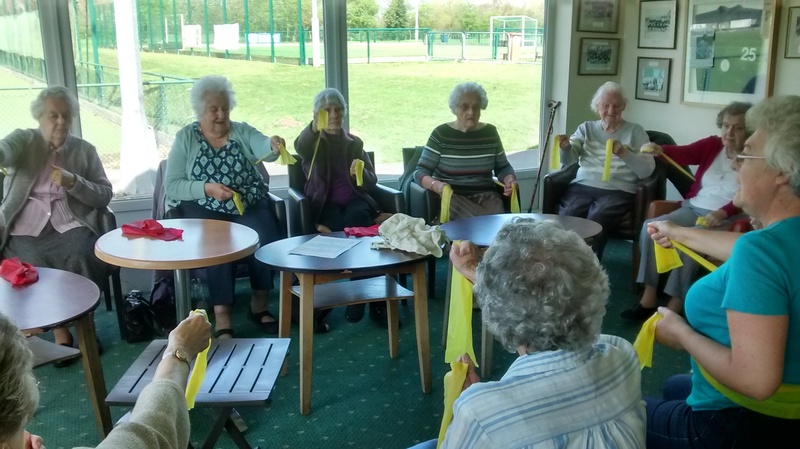 There were lots of exercises for flexibility and Eula gave advice on how to do the exercises safely. Members enjoyed the session and the unique way that Eula explained the movements to them – lots of laughter and interaction. Maureen Anderson kindly gave the Tarporley OPAL club a very interesting talk on the history of Morris Dancing. She was the Foreman of Chester for 39 years and the Squire of Comberbach for a number of years too. She retired from Morris Dancing in 2000. It was an entertaining talk with lots of photos of the performances that she took part in. It prompted a great discussion with the members and volunteers and a of course lots of laughter too. Morris Dance has been part of English life for at least six hundred years and may be much older. While the style is peculiar to the English mainland, there remain some similarities to Catalan and to Basque dancers. 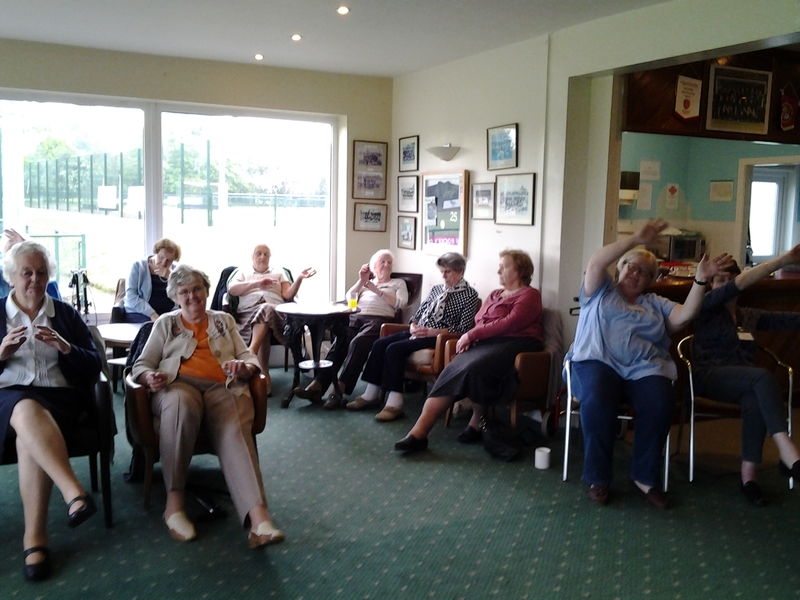 The members are looking forward to Maureen returning later in the year to do her marvellous exercise routine. “The Funky Choir were brilliant and took the time after to talk to our members after they had finished. 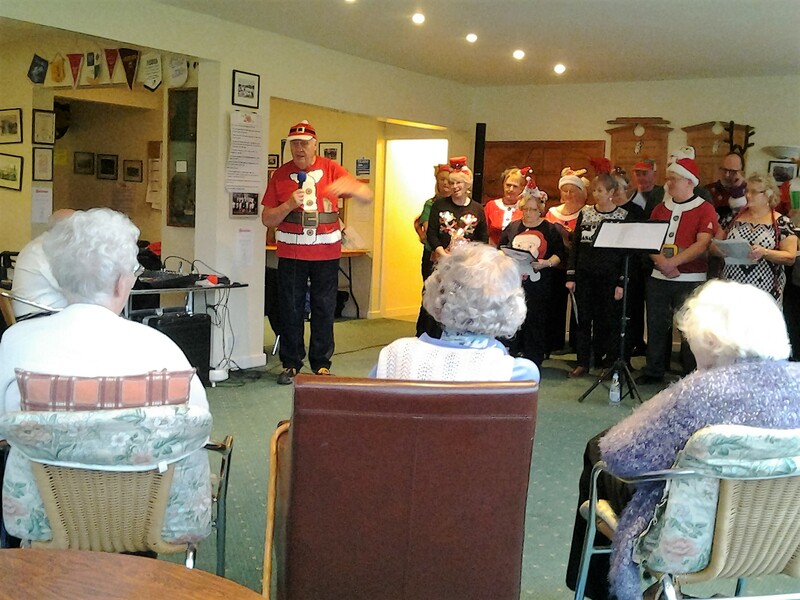 Members and volunteers enjoyed the sing along – songs old and new – in an hour long session that was thoroughly enjoyed by us all. Lots of laughter all round ! 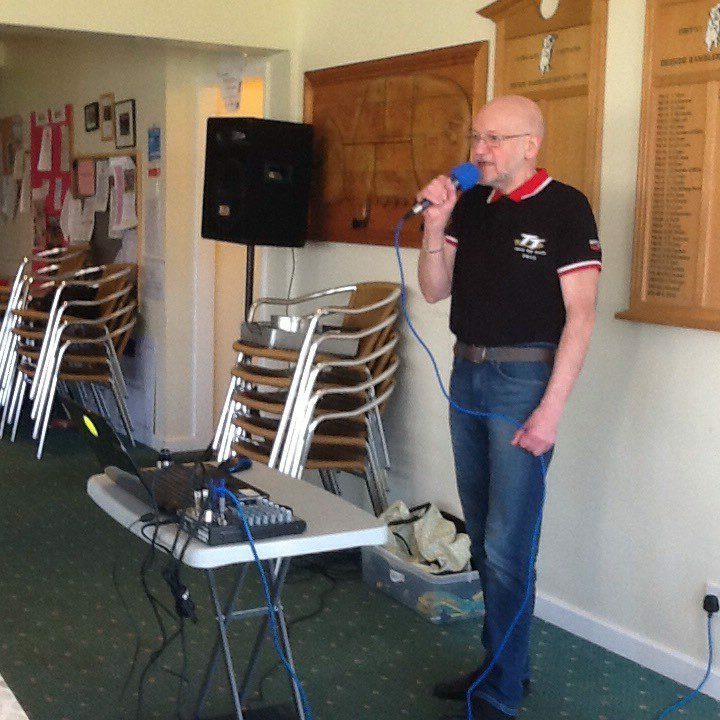 Ken Walker – singer and entertainer performs at Tarporley OPAL Club 26/01/18. Members request that Ken continues to come back to see us as they enjoy his repertoire of music from a bygone era. Roy Clinging performs Cheshire Folk Songs with tales of Cheshire Folk Lore to accompany each song. Roy Clinging is a native of Cheshire in the United Kingdom. Roy began performing in the UK folk scene during the early 70’s playing guitar and English concertina. 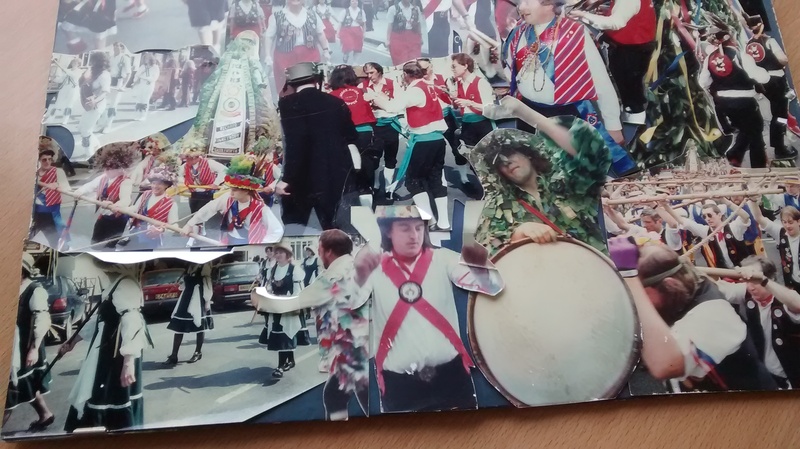 He was instrumental in creating several folk clubs in the Cheshire area, has been an active performer of folk Souling plays, and is also a member of the Chester City Morris Men. Roy has done extensive research into the songs and traditions of Cheshire including maritime material.